Deb's Cup of Tea: It's the Little Things. Last Sunday, I headed out to Kohl's to use the Kohl's money sent to me by someone. I had 3 gifts left to get and a reasonable idea of what I wanted. I had also been told it was okay to spend some of the money on myself, something, in the blinding drive to give to friends because I want to, I forget, beyond basic necessities. As I was lounging around the house today; we have Thursday and Friday off as the holiday falls on the weekend; it occurred to me the sender probably wants to know that I did follow his or her instructions. Viola. 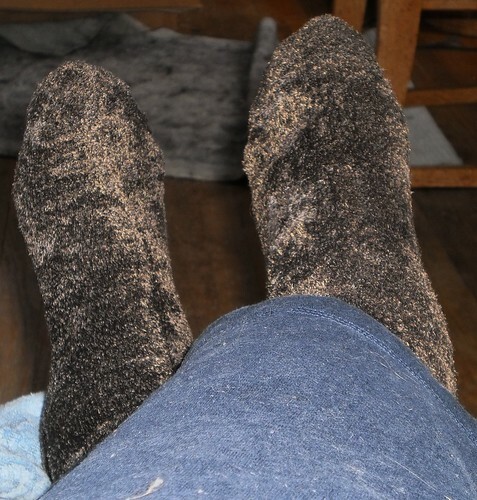 I got the three gifts I wanted to get and then, because the prices were quite beyond reasonable, I was able to get a package containing two pair of this wonderfully fuzzy, very comfortable and toasty warm socks. I neglected to photograph the other pair, but it's the same color of brown with pink snowflakes. Just socks and three gifts didn't use up the whole amount. I did buy 2 packages of underwear. Santa doesn't have to leave that in my stocking this year. I can replace the stuff where the elastic is just barely hanging on. And no. I am not photographing that.